Maurice and Norman Messer, father-and-son business partners, know a good product when they see it. That product is the Holocaust, and Maurice, a Holocaust survivor with an inflated personal history, and Norman, enjoying vicarious victimhood as a participant in the second-generation movement, proceed to market it enthusiastically. Not even the disappearance of Nechama, Norman’s daughter and Maurice’s granddaughter, into the Carmelite convent at Auschwitz, where she is transformed into a nun, Sister Consolatia of the Cross, deters them from pushing their agenda. Father and son embark on a tour of the Auschwitz-Birkenau death camp, which Maurice—now the driving force behind the most powerful Holocaust memorialization institution in America—organizes to soften up a potential major donor, and which Norman takes advantage of to embark on a surrealistic search for his daughter. At the death camp they run into assorted groups and individuals all clamoring for a piece of the Holocaust, including Buddhist New Agers on a retreat, Israeli schoolchildren on a required heritage pilgrimage, a Holocaust artifact hustler, filmmakers, and an astonishing collection of others. 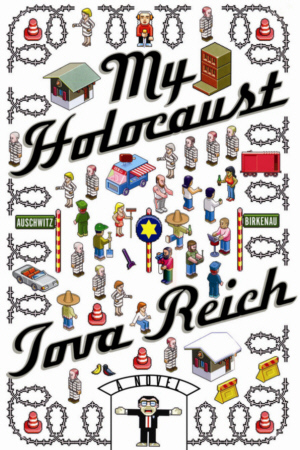 All hell breaks loose when Maurice’s museum is taken over by a coalition of self-styled victims seeking Holocaust status, bringing together a vivid cast of all-too-human characters, from Holocaust professionals to Holocaust wannabees of every persuasion, in the fevered competition to win the grand prize of owning the Holocaust.